As a reviewer, I'm always hoping to find something different, creative, unexpected when opening a fresh comic book to review. Luckily, 'Spencer & Locke' by David Pepose, Jorge Santiago, Jr., and Jasen Smith is that kind of comic. It's only gotten better through three issues as Locke's mental state spirals out of control while being drugged and tortured. What started as a cute idea, re-imagining iconic comic strip 'Calvin and Hobbes' as a hard-boiled crime noir, has evolved into one of the most disturbing and thrilling psychological dramas in comics. Locke's descent into madness is accelerated with an injection of a narcotic cocktail into his bloodstream by his captors. It unleashes a psychedelic alternative reality in his mind. Already affected by childhood trauma that causes him to imagine his stuffed panther as his real life investigative partner, Locke retreats to the persona of 'Rocketman Reynolds,' a Flash Gordon-type on a galactic mission. Reality and imagination collide in Locke's psyche as he tries to flee the men holding him hostage. Jorge Santiago brilliantly captures these different states of reality with versatility and precision. He has to alternate between the space adventure in Locke's head in the style of silver age comics, the comic strip of the flashbacks and art in the present day. It seems disorienting but it mirrors the dizzying elements going on in Locke's mind. Then we follow Spencer's perspective in finding Locke. Each scenario is distinctive and fully realized. Jasen Smith's colors also must adjust for each running storyline in each reality. Deeper richer colors for present day faded hues for the flashbacks and bolder, brighter colors for 'Rocket Reynolds' serve as perfect individual palettes. It's quite a task for the artists but they are more than up to it. The struggle for survival is thrilling while the revelations of Locke's past is devastatingly sad. He is a man fighting the demons of his past, riddled with guilt and anguish, driven to delusion as a coping mechanism. 'Spence & Locked' is steeped in psychological trauma and violence. It's a crime drama with layers upon layers. Pepose has revealed more and more with each issue, keeping the reader off balance with twists and reveals as the protagonist spirals out of control. You're getting your money's worth and then some. 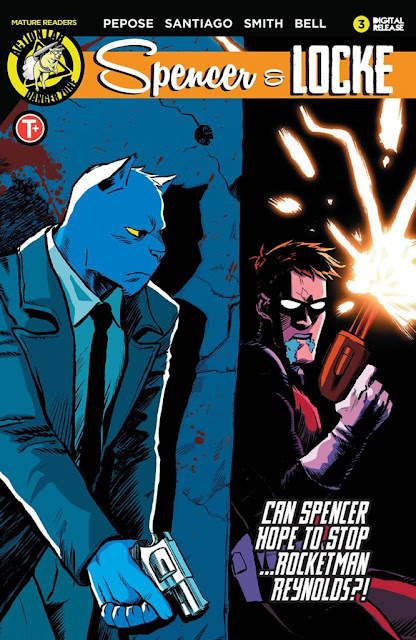 'Spencer & Locke' continues to impress with new revelations and the upping of action, violence, and psychological drama. To say there isn't anything like this in comics right now would be an understatement. Pepose, Santiago, and Smith have delivered a multi-layered tour de force of a thriller. It takes your expectations and blows them away. 'Spencer & Locke' is an unexpected thrill that must be read.